This year at WPPI a bunch of photographers will be offering mentoring sessions and donating all the profits to Thirst Relief. YAYAYAY! 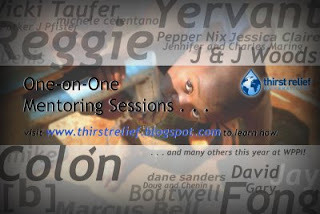 I am so happy you are continuing your relationship with Thirst Relief (I know they are your favorite Charity). My husband and I still continue to give to them! Clean water is the answer to almost all disease erradication and economic issues worldwide. After studying policy and travelling, the issue of water seems to always be the most obvious solution. Even Jay-Z caught on. Gimme a "W" "A" "T" "E" "R"! Seriously Deej, this is what makes me proud of you as a friend. Thanks darling! ...and that's wonderful that you've continued supporting them! Right on! Bid on DJ! And go big! I have a hunch that whoever wins the DJ auction (I suspect it'll be a she :)) will be the most stoked person in Las Vegas. The free meal (good luck if you think you're gonna try and pay when he's not looking) and the free software (unfair competitive auction practices alert ... who can compete with that) will pale in comparison to what you're gonna get just by getting him to bleed his wisdom on you for 90 minutes. It's the best money you'll spend on your business this year. Guaranteed. haha...I'm sure it'll be like most auctions where everyone bids at the last minute. To be honest I think the bidding is a bad model for something like this especially given that all of them end at the same time. There needs to be a buyout option so once someone is "taken" the other bidders can move on to someone else. I would vote for Dane and Matt... they are true Lovecats! haha I agree DJ - if there were rungs like Denis, Gary, Yervant, Jerry, you, Mike, Jessica, Becker & Beckstead ended one time - then a few more ended a day later - people would know who they did or didn't get and adjust from there. That would be a much better plan!